You can see it from miles away. 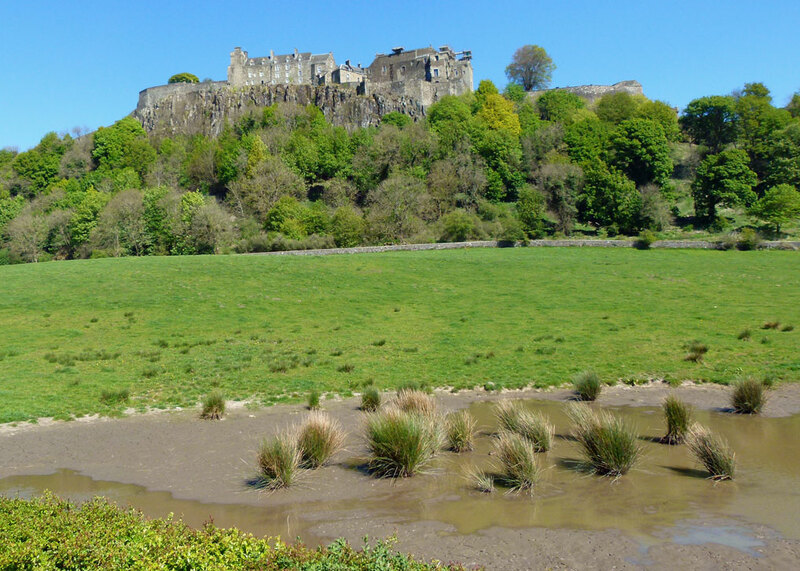 Stirling Castle stands guard from the top of a massive volcanic plug, with steep cliffs on three sides, towering above the ancient crossing over the River Forth and the route armies take between Highland and Lowland. 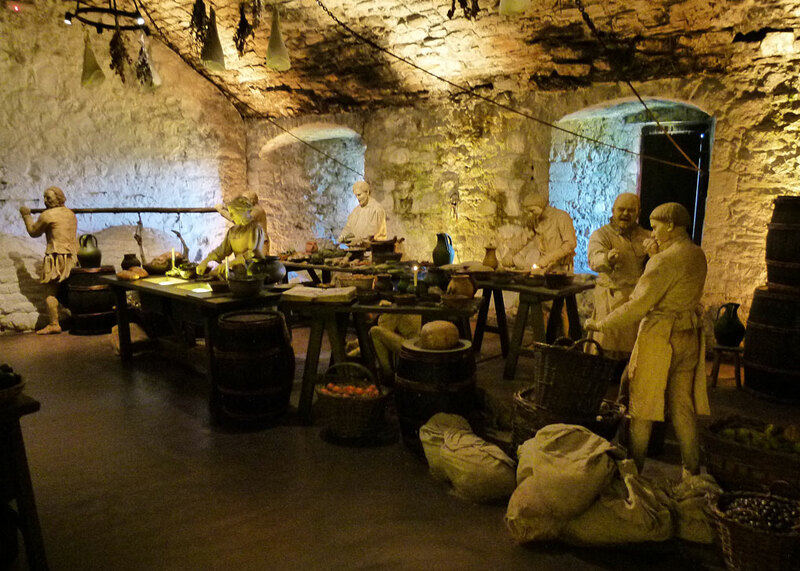 It has witnessed so much of Scotland’s history, including two of its most significant battles, and all the usual shenanigans you’d expect of a mighty, royal, Scottish fortress – murder, intrigue, siege, and all the rest. 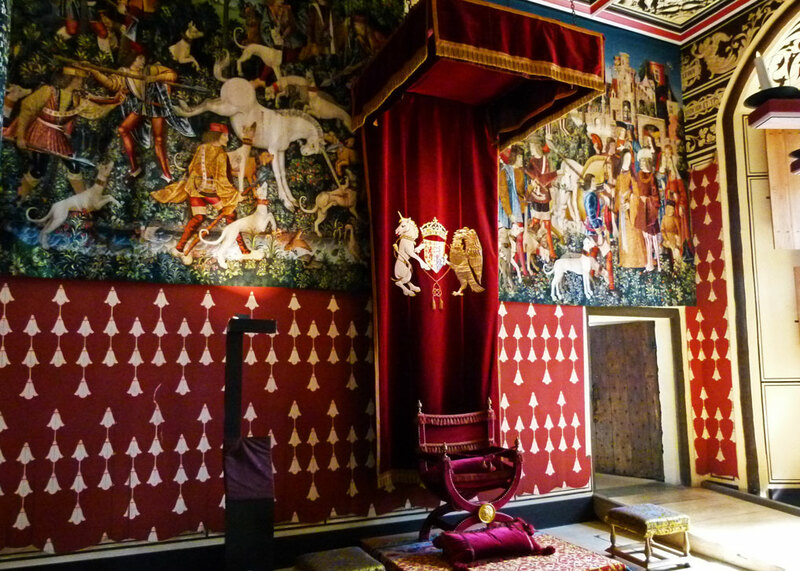 But if you’re thinking “dark, damp medieval castle” – think again; Stirling Castle shows the Stuart kings of Scotland at their opulent, Renaissance best – or worst, depending on your point of view. It has been quite beautifully restored and, in some ways, is more enjoyable than its massive cousin, Edinburgh Castle, just down the road. The early story of Stirling Castle is shrouded in the fog of legend. Was it fortified by the Romans, the local tribe, the Votadini, or the Picts? Was it even King Arthur’s Camelot? Alas, there is no evidence for anything on the site before the early 12th century, when King Alexander I dedicated a chapel to St Michael there. 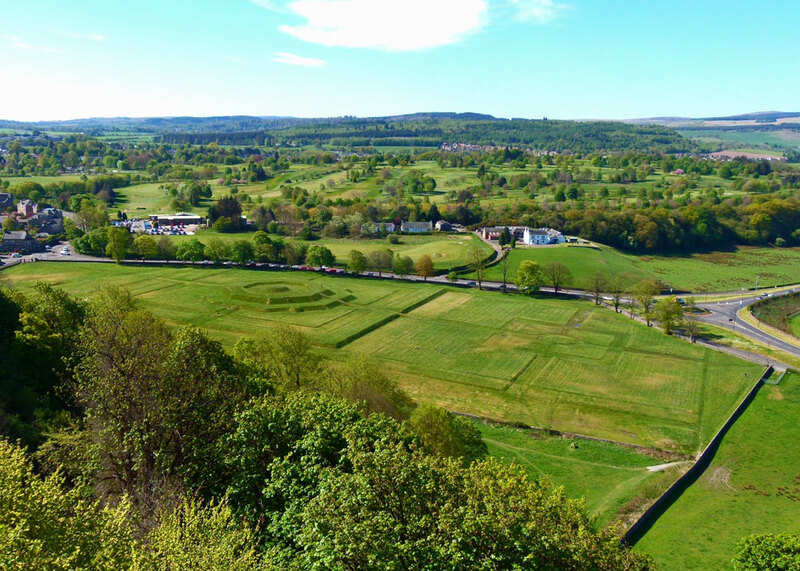 Stirling Castle had royal connections from at least that point onward; Alexander died within its walls in 1124, David I founded Cambuskenneth Abbey in its shadow in 1140 and William I (William the Lion) created a royal hunting park nearby. 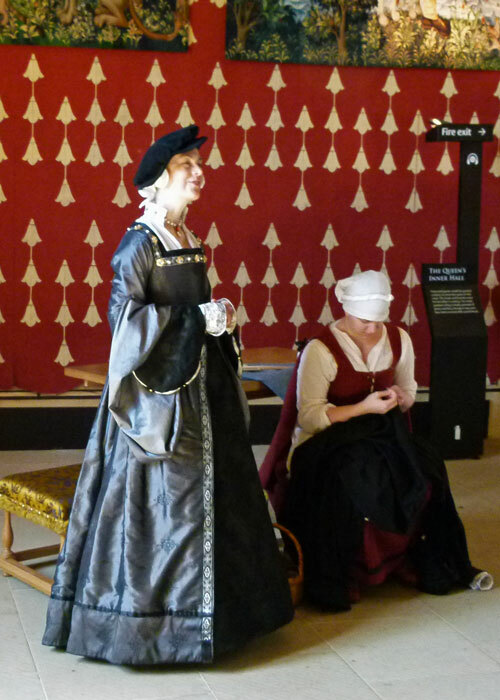 Thereafter, Stirling Castle changed hands more often than Henry VIII later changed his women, in the deadly game of thrones between Scotland and England’s monarchs. William the Lion first lost the castle to the English in 1174 – part of his just penalty for joining a rebellion against the English King Henry II and, worse, getting himself captured; but William bought it back from Richard I of England in 1189, when the latter needed cash to go on crusade. The strategic importance of Stirling Castle ensured it played a major part in the Wars of Scottish Independence. In 1296, Edward I of England found the entire Scottish garrison had done a bunk and he was able to walk into an open castle unopposed. The following year, the Scots won it back after the Battle of Stirling Bridge, when William Wallace and Andrew de Moray’s screaming hordes spliced a larger English army in two, achieving a great, but short-lived, victory. The original Stirling Bridge has gone, but you can see its replacement, and the battlefield, from the castle walls. 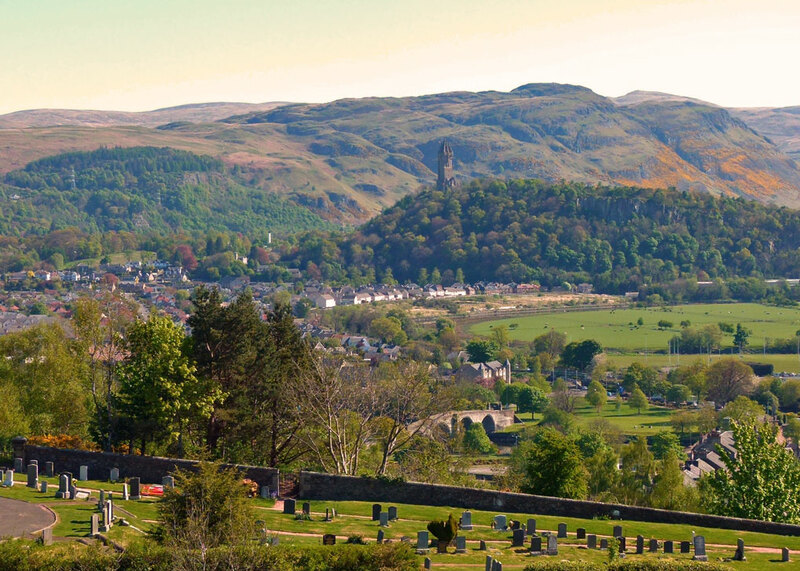 There’s also a great view of Abbey Craig, the hill where Wallace is said to have concealed his troops before the battle, and the National Wallace Monument that proud Victorians built on it in his memory. 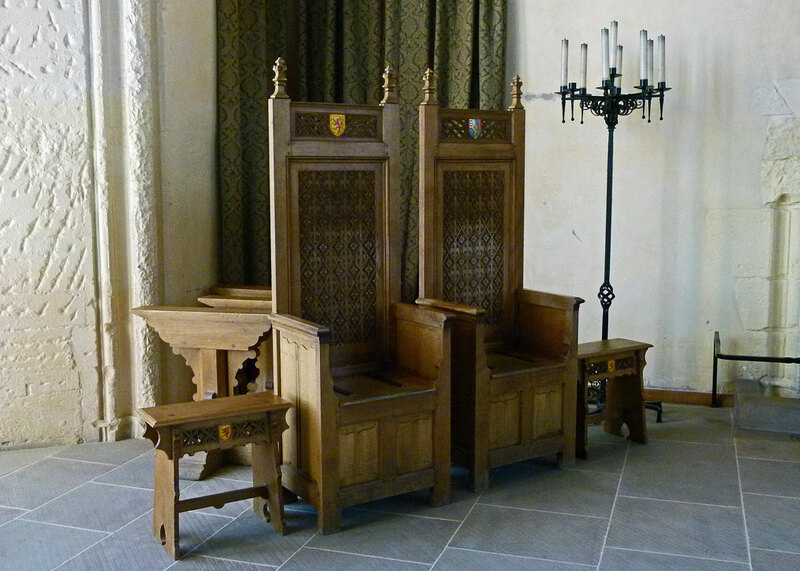 In 1298, Stirling Castle changed hands again following the Scots’ defeat at the Battle of Falkirk. 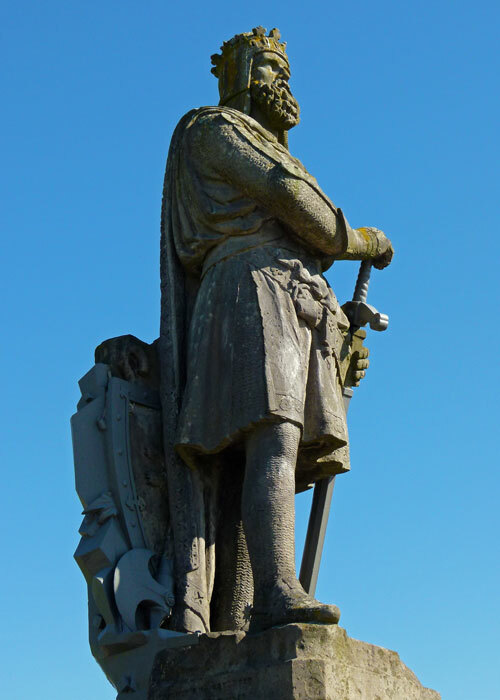 It was recaptured from the English once more, by Robert the Bruce, in 1299. Then in 1304, following a four-month siege in which 12 enormous siege engines – plus an even larger one that gloried in the name warwolf – lobbed projectiles at the castle, the governor, Sir William Oliphant, surrendered Stirling Castle yet again into the welcoming clutches of Edward I. By 1314, it was besieged by King Robert the Bruce’s younger brother, another Edward. He reached an agreement with the English commander, Sir Philip Mowbray, that the defenders would lay down their arms if they weren’t relieved by midsummer’s day. This forced the reluctant hand of the English King, Edward II (son of Edward I), who marched north with an enormous force, only to be decisively beaten by King Robert’s army at the Battle of Bannockburn on the 24th June. Accordingly, the castle surrendered once more to the Scots. You can see Stirling Castle quite clearly, rearing up on its mighty crag, from the field of Bannockburn a couple of miles to the south. A simple list of castle-swapping becomes tedious. 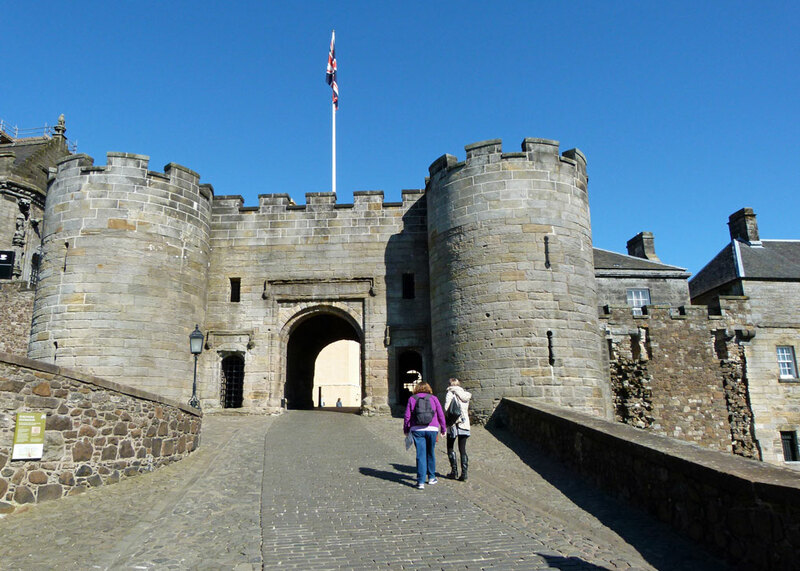 Trust me – Stirling Castle was besieged and changed hands several more times. It was captured by Oliver Cromwell’s Parliamentary forces in 1651 during the Civil War (commanded by General Monck, the man behind the restoration of the monarchy); and the Jacobites under Bonnie Prince Charlie failed to take it in 1746. In fact, there is little trace of the medieval fortress at Stirling now; most of the buildings you see date from the 16th century. It became a favourite of the Stuart monarchs, who undertook major refurbishment work. Mary, Queen of Scots, was one of its most famous residents. She saw her son, the future James VI of Scotland and James I of England, for the last time here. James was christened in the chapel, was crowned infant king of Scotland in Stirling’s nearby Church of the Holy Rude following his mother’s forced abdication and spent most of his tough, bleak, boyhood within the fortress walls. 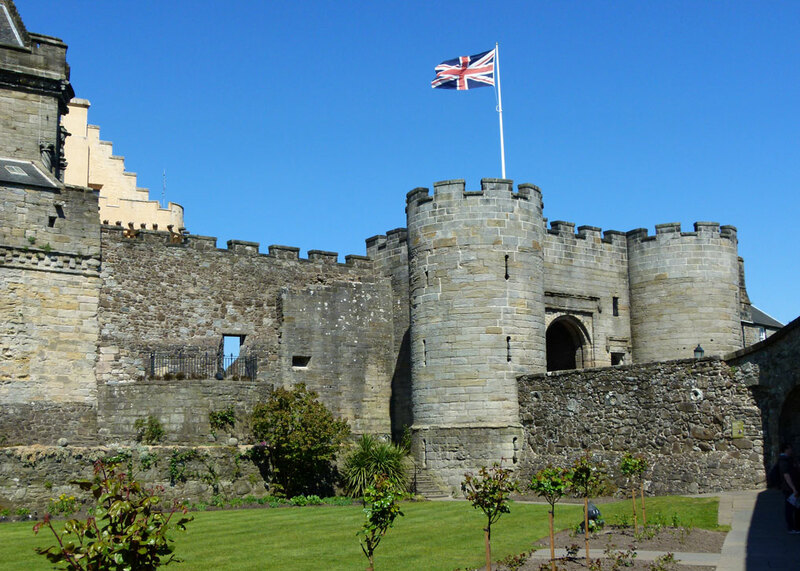 When James won the English throne and headed south, Stirling Castle, like other royal Scottish castles and palaces, began an inevitable process of decline. From the late 17th century until 1964, Stirling Castle was essentially an army base, its opulent buildings converted to military use. So let’s see what the previous occupants have left us. We attached ourselves to a free guided tour; it was the word ‘free’ that particularly appealed, though of course what it really means is that a tour was included in the entrance fee, if we wanted to take advantage of it. Our guide, despite being handicapped by a pair of perfectly dreadful tartan trews, was small, rosy-cheeked, twinkly and amusingly informative. He began by asking where his audience came from. “Chicago.” “Arizona.” “California.” “Toronto.” “Dusseldorf”. The memsahib and myself were the only two Brits there; a token Scot and a slightly nervous English invader. But, clearly, it’s high time someone else captured the place anyway. The approach to Stirling Castle is from the south, up the gently sloping volcanic tail from the town and, for obvious reasons, this was always the most heavily defended part of the fortress. The outer defences are mostly 16th century, though more modern cannons poke threateningly through the walls. At one time, the stonework was coated in a limewash known as ‘King’s Gold’ – which has been recreated for the exterior of the restored Great Hall. The defences would have been higher once, too, and there would have been more of them. It must have been a literally awesome sight – and was intended to be. To the left of the gatehouse is a gentle area, the Queen Anne Garden, a garden since the 1400s, possibly, and used for bowls in the 17th century. It is named for Anne of Denmark, queen consort to James VI of Scotland, and I of England. Over the battlements to the west can be seen, far below, the remains of the King’s Knot. This is an earthwork which was part of Stirling Castle’s formal royal gardens, situated in the grounds of the King’s Park, where Scotland’s monarchs once hosted jousting and hunting. The gardens were spruced up for Charles I’s Scottish coronation in 1633 and restored by order of Queen Victoria in 1842, but are now just enigmatic and empty. Perhaps Mary, Queen of Scots, played football in the gardens. What is claimed to be the oldest football in the world, made from a pig’s bladder, wrapped with cow’s hide, and about half the size of a modern match ball, was found behind panelling in the Queen’s chamber of the royal apartments. How it got there is anyone’s guess, but the queen is said to have enjoyed football. Presumably, she would have supported Celtic or Hibernian. Towering over the walls of the Queen Anne Garden is part of the Royal Palace, where the ball was found, and which was started by James V in 1537 and completed by his widow, Mary of Guise – Mary, Queen of Scots’ parents. The walls of the palace are decorated by an extraordinary array of fantastic sculptures, known as the Stirling Sculptures. There are saints, gods and goddesses, mythical beasts – and, in pride of place, James V. Once, they would probably have been richly coloured. 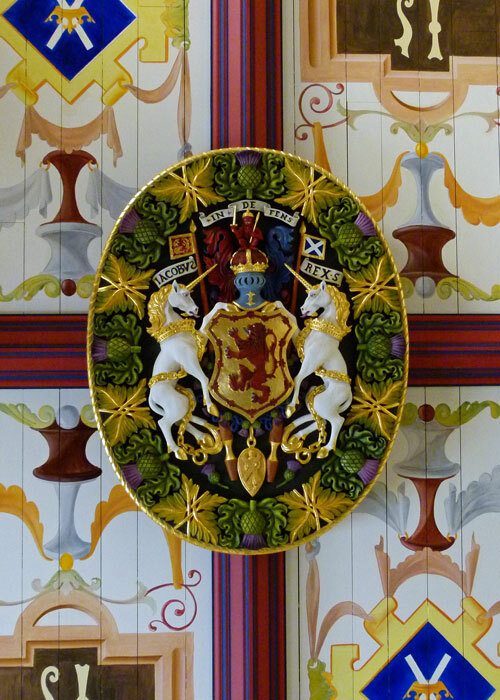 The palace was a statement of Scotland’s – and its monarch’s – sophistication and wealth. 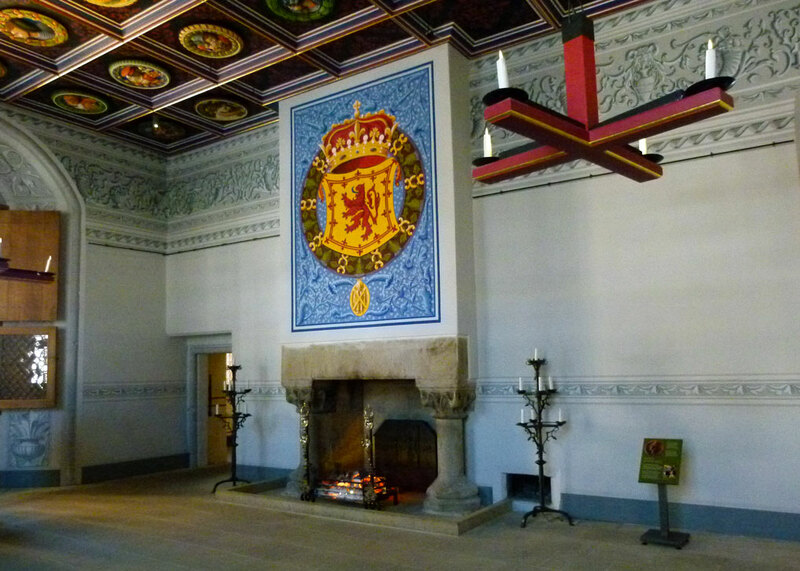 Inside, the royal apartments are shown restored to how they might have looked when Mary of Guise ruled as regent for her daughter. This ambitious project took about 5 years and cost some £12 million. 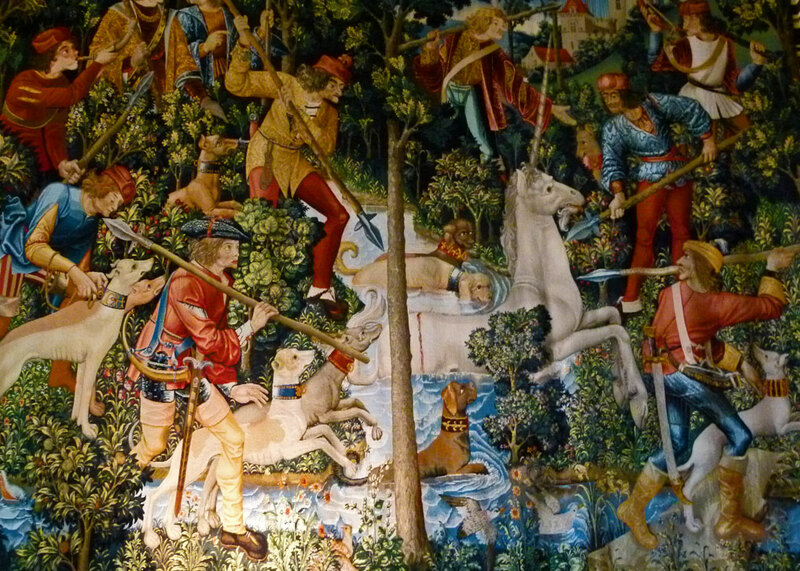 Though largely unfurnished, hanging from the walls of the Queen’s inner hall are sumptuous reproduction tapestries showing the Hunt of the Unicorn. Each tapestry took between 2 and 4 years to make and were produced in a tapestry workshop in the castle’s nether bailey – where there is now a tapestry exhibition. 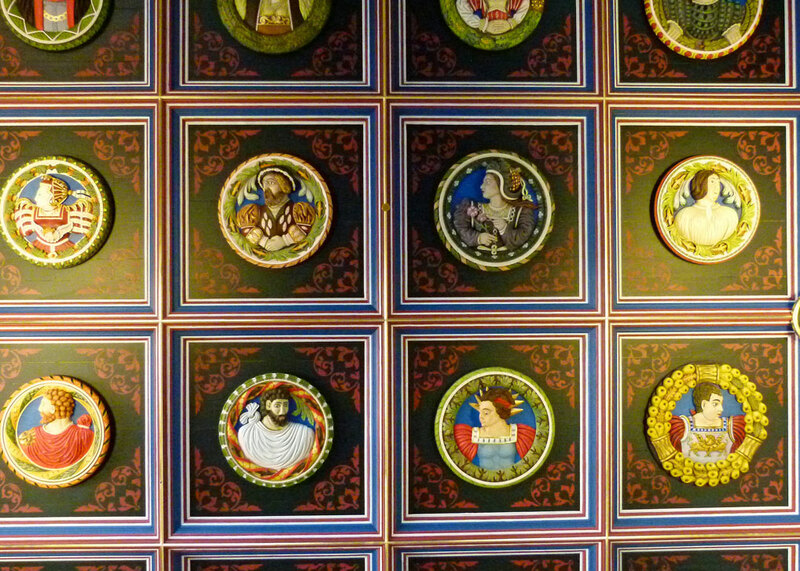 The ceiling of the King’s inner hall once boasted a series of carved wooden heads, commissioned by James V in the 1540s, representing real and historical people as well as classical figures. 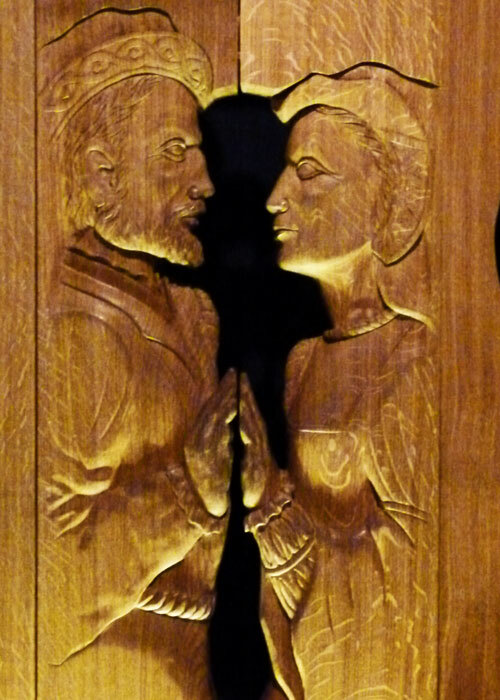 Some of the original Stirling Heads have survived and are shown in a special exhibition, along with some reproductions – and a touching modern carving, by John Donaldson, depicting James V and Mary of Guise; it is called ‘Crowning Glory’. The reproduction Stirling Heads have been cleverly painted, like much of the palace interior, to appear 3-D. The whole thing is quite breathtaking, not least because the colours are so vivid. To modern eyes they may seem over-gaudy, perhaps even a little kitsch; but it is believed they are authentic. There some nice touches, too; costumed staff are informative and fun and I was amused to see some 16th century golf clubs in James’s bedroom. The Great Hall was built between 1501 and 1504 by James IV. This too has been heavily restored, including the King’s Gold rendering mentioned earlier. The hammerbeam roof, faithfully reproduced, is magnificent – there can’t be many places where you can see one as it would have looked when relatively new – and lovely windows decorated with stained glass heraldic devices fill the room with light. Five fireplaces line its draped walls and, at the business end, are two simple thrones – a his and hers. Personally, I thought they looked like rather grand commode chairs, but of course everyone has to sit in them and have their photographs taken. The Great Hall was witness to big occasions, not least a meeting of the Scottish parliament in 1578. But possibly the most famous celebration of all was that for the birth of Henry, first son of James and Anne of Denmark, in 1594. On that occasion, the fish course was served on a fully rigged ship, dragged into the hall and featuring mermaids and functioning cannons. This, so Scottish Tourism folk say, is the origin of the expression “to push the boat out”. Others suggest the phrase derives from a party sailors had before setting sail. These days, the hall can be hired for weddings and corporate events. 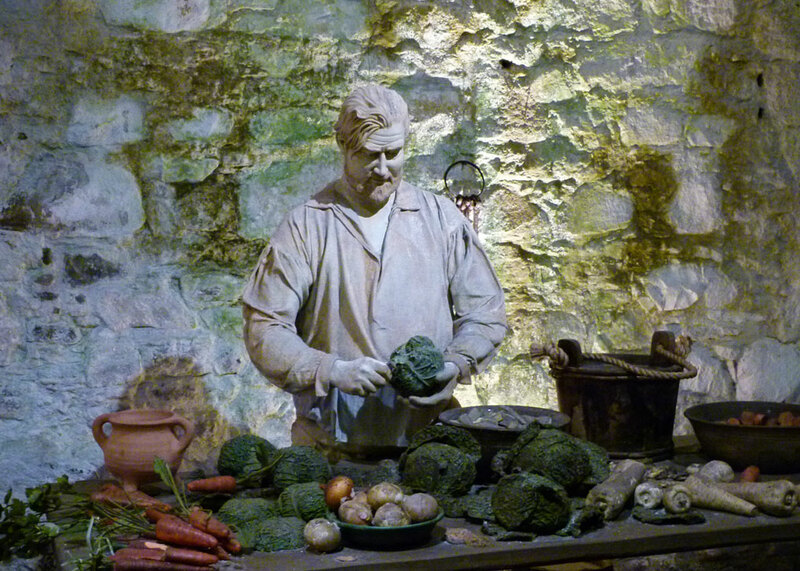 Close by the Great Hall are the Great Kitchens, housed in the oldest part of the castle. These include ghostly figures engaged in preparing a great feast, sacks of ingredients all around, tables heavy with artificial food. Much as many of today’s chefs, a lot of time seemed to be wasted on pretentious presentation. Take a Pecok, breke his necke, and kutte his throte. And fle him, the skyn and the ffethurs togidre, and the hede still to the skyn of the nekke. And kepe the skyn and ffethurs hole togiders; draw him as an hen, and kepe the bone to the necke hole, and roste him. And set the bone of the necke aboue the broche, as he was wonte to sitte a lyve. And abowe the legges to the body, as he was wonte to sitte a-lyve. And whan he is rosted ynowe, take him of, and lete him kele. And then wynde the skyn with the fethurs and the taile abought the body. And serue him forthe as he were a-live; or elles pull him dry, And roste him, and serue him as thou doest a henne. 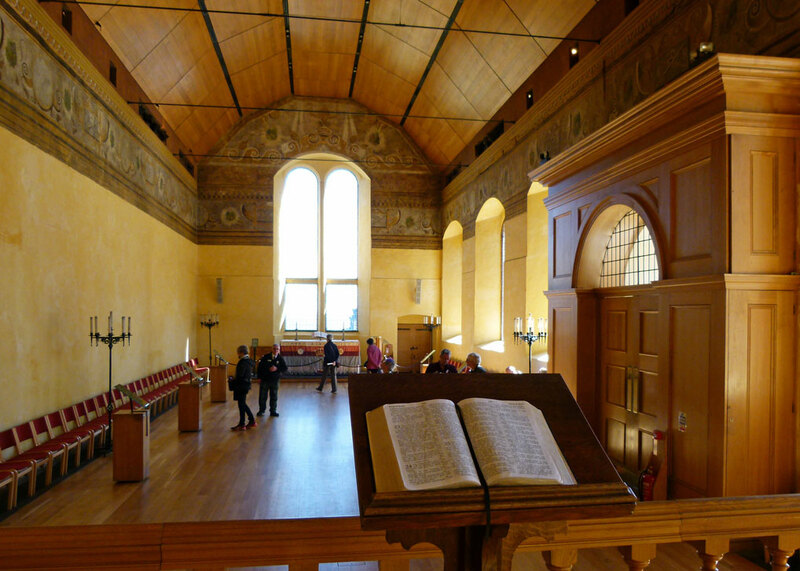 Next to the Great Hall is the Chapel Royal, the latest version of a chapel in the castle, built in just seven months in 1594 for the baptism of Prince Henry. The current chapel, too, has been greatly restored; appropriately enough, a King James Bible lies open on a lectern at the west end. The outline of the chapel’s immediate predecessor, where Mary, Queen of Scots was crowned, can be seen in the cobbles outside. At the far end of the castle is the nether bailey, where there are some great views, a 19th century powder magazine, guardhouse and the tapestry exhibition mentioned earlier. But it doesn’t feature much on the tourist trail, so that struck me as an excellent reason to see it. Our tour – the guide had dispensed with us long ago – finished up at the Regimental Museum of the Argyll and Sutherland Highlanders. This is housed in the King’s Old Building, built in the 1490s on the highest part of the castle rock, right on the edge of the precipice. The Argyll and Sutherland Highlanders were based at Stirling Castle from 1881 and were amalgamated into the Royal Regiment of Scotland in 2006. 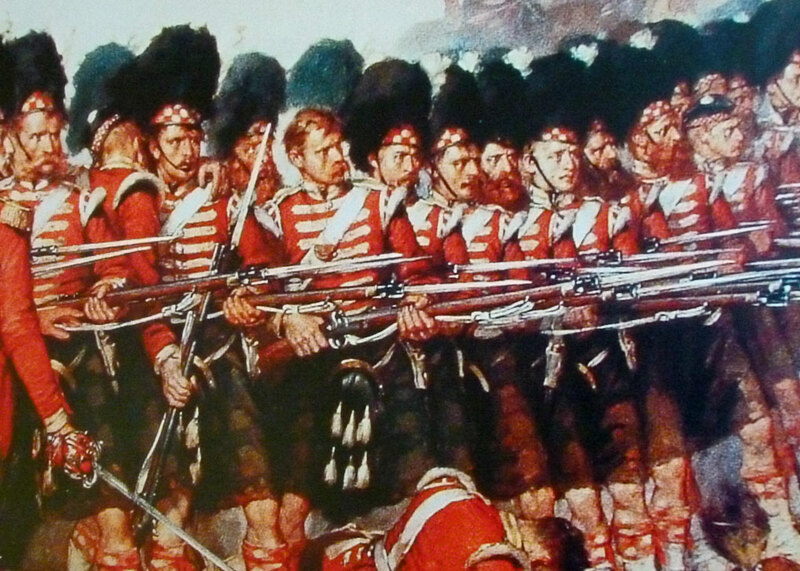 And they were the inspiration for the phrase, the thin red line, evoking the bravery of British infantry in the face of superior odds, when Times correspondent W H Russell, witnessing the 93rd Sutherland Highlanders’ stand at the Battle of Balaklava in 1854, wrote that nothing stood in the way of the Russian cavalry except a “thin red streak tipped with a line of steel”. 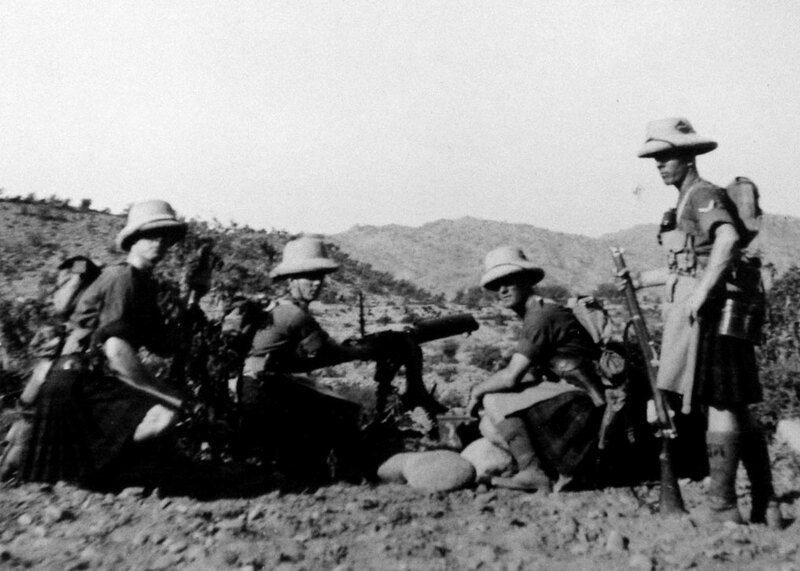 Rudyard Kipling’s poem, Tommy, about the British soldier included the line “O it’s ” Thin red line of ‘eroes, ” when the drums begin to roll.” Somehow, ‘thin red line’ got transferred into an account of US forces at Guadalcanal in the Second World War – despite the fact that the Argyll and Sutherland Highlanders were nowhere near at the time. 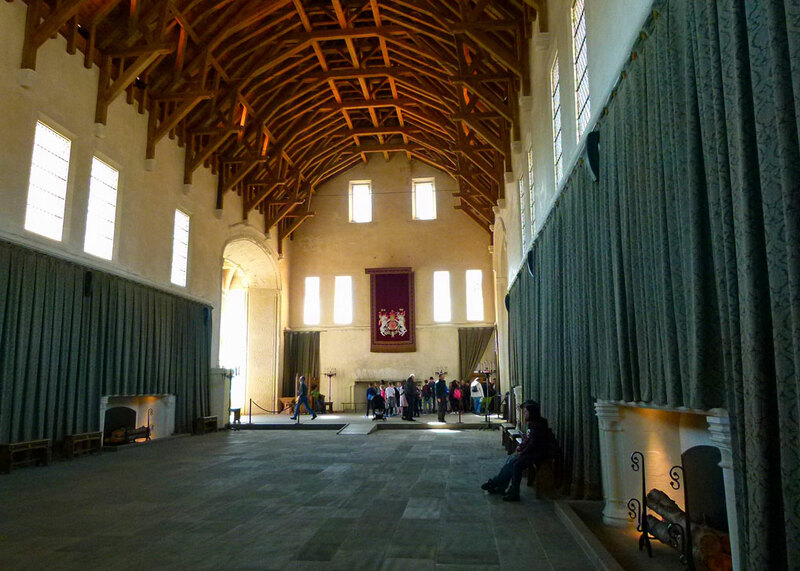 The King’s Old Building is a suitable place to end our tour of Stirling Castle, because it is thought to be somewhere in its walls – or, at least inside a previous version of the same building – that one of the castle’s most famous and gruesome events took place. The Stuart kings had a long-standing feud with the Douglases. 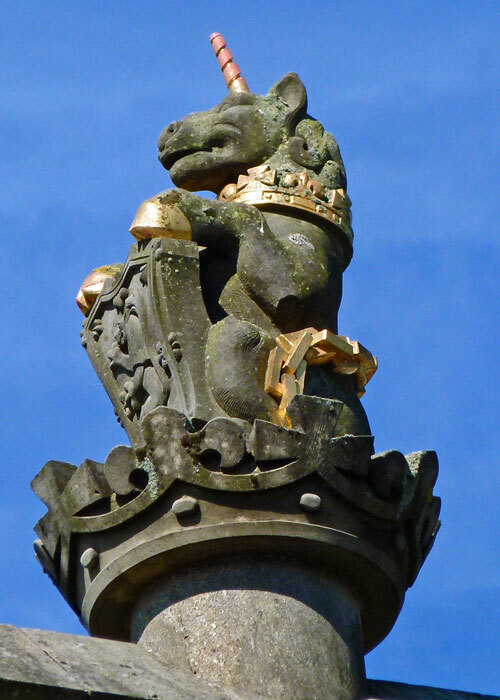 In 1452, James II invited the 8th Earl of Douglas, William, to dine with him at Stirling. Actually, they had previously got on pretty well, but James suspected double-dealing and accused William of forging an alliance with the king’s enemies, the MacDonalds and the Crawfords. In the ensuing argument, James stabbed the Douglas, the royal courtiers waded in – one apparently dashing the young Earl’s brains out with a pole axe – and the body was tipped out of a window onto the rocks below. Regular readers and history buffs will recall that, as a boy, James was witness to the murder of the 6th Earl of Douglas and his younger brother at the infamous Black Dinner in Edinburgh Castle. Oh – one final thing: if anyone of a certain age thinks they recognise Stirling Castle, it was used for the exterior shots in the 1970s TV drama Colditz, about the adventures of Allied POWs in Colditz Castle in Saxony during World War Two. I read years ago a theory that Stirling was most likely King Arthur’s place, and from your mention of it, I guess there are others who also think so; I wonder if anything definitive will ever be discovered about him! So many references to Arthur, mostly in the west of England, though still far enough apart to make him quite a busy chap – if he existed! Another wonderful castle with a hectic history. Thanks for another excellent (and entertaining) tour! I hadn’t thought of the Oliphaunts – but it’s an interesting image..! Yes – we got lucky with the weather; but you’re right, when it’s dreich it can add to the atmosphere. A well researched history of the castle. It is many years since I visited and the displays seem to have been altered/improved since then. Thanks CP – they’re really made an effort with Stirling Castle and it shows. 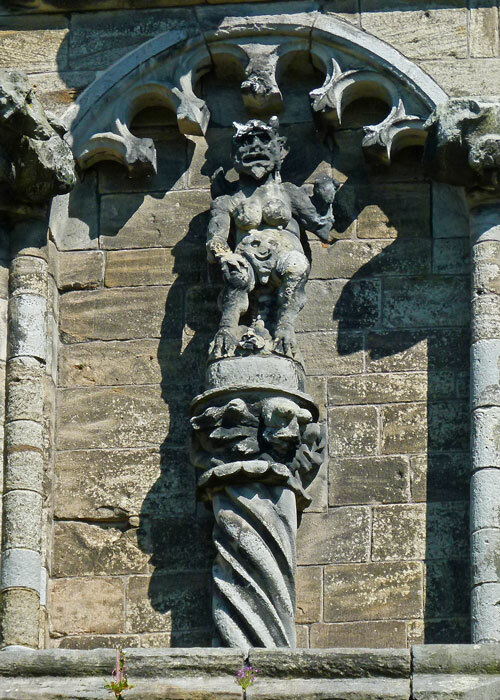 Hi Mike – that was an excellent write up on the history of Stirling – really good – I always get befuddled about all the happenings up there, especially as my knowledge of Scottish history is very vague. Thanks Hilary – can you believe I forgot all about the skeletons?! But I’ve looked back to your article – fascinating! The Civil War and Jacobite connections with Stirling are perhaps the strangest part. 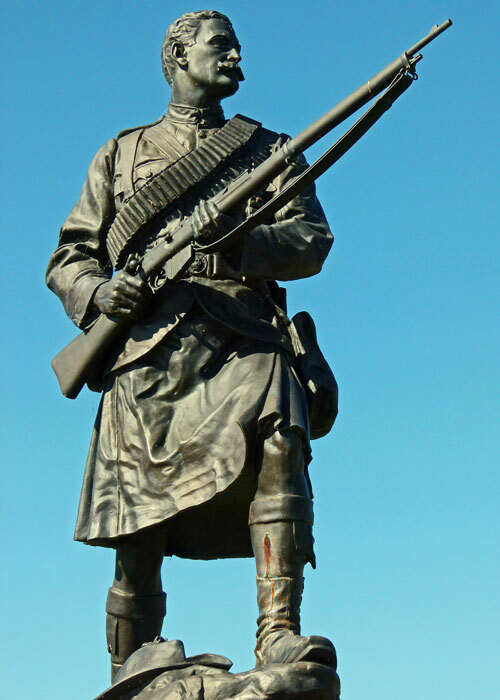 Improbably, General Monck was successful in Stirling. And although I can see why Bonnie Prince Charles wanted to launch his re-claiming of Britain from Scotland, we have to note that he failed!!! You can’t really escape the Civil War and the Jacobites in Scottish history, Hels. Yes, Charlie failed – personally, I think he was wrong to try – but hindsight’s a wonderful thing! I had forgotten the castle was used for ‘Colditz’ – if I ever knew! I loved the peacock recipe! 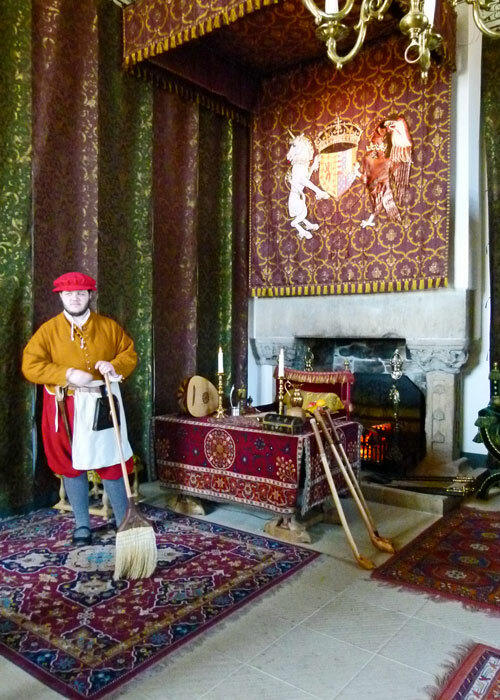 Thanks for this wonderfully detailed history and tour of Stirling Castle, Mike. I really like the photo of the bridge and Monument from the castle walls. That’s the best view, Clare – and it was a cracking day. Another great post. I really enjoyed Stirling Castle, I thought it was better than Edinburgh Castle! Thank you. Yes – Edinburgh is amazing, but it’s too much to take in in a day, I think. Thank you, well done as always. 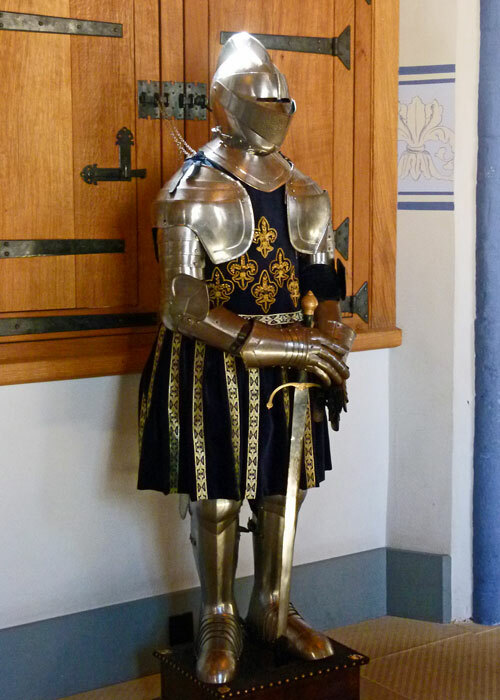 I’ve been lucky enough to tour Stirling Castle, but of course, I didn’t discover all of the great details of its history until now. Mary liked football? That immediately put some humanity into that long dead queen. I guess Richard I was truly bitten by the crusade fever if he had to let go of such a lovely piece of real estate. Thanks for a re-visit to a beautiful place. I think Richard I simply liked a good fight – he certainly didn’t spend much time being king in England! So much to see. I had fogotten about its connection with the series Colditz until reading your post. It must have cost a penny or two to refurbish it all. Millions of £ – I wonder how long it will take to re-coup? A lot of history- and such a beautiful castle! Terrific shots, Mike. Seeing your photos brings back fond memories of my visit. The caste is magnificent. Great post and photos as always, thank you for being so interesting! Cool pics and history as always and looks like a lovely blue sky day for it. Sterling stuff (Please forgive me). Excellent photographs, too. I like the football find and its possible interpretation. Nothing to forgive, Derrick; I was relying on you to crack that pun..! Thank you for that. I always get more than I expect from you…well worth the entrance fee. Thanks, Mac – that’s flattering. You did a much better job with the history than I have done with Stirling Castle. I have one post on it and more to come next week. We got lucky with the weather, Marcia. I’ll check your posts out. Nice set of photos and history. I’ve always preferred Stirling Castle to Edinburgh Castle and up until recently it was very good value for money- unlike Edinburgh which is fairly pricey at £17 adult and £10 child if you have a family in tow. (used to be half price for S.C. but now only £2 cheaper than E.C. What a castle! What a history. Not to be missed. I didn’t know that they filmed parts of Colditz there. That’s made me want to watch it again. I know a bit about how Stirling changed hands during the thirteenth and fourteenth centuries, but I didn’t know about it’s later history. The decorations are very gaudy, even by medieval standards. I’d love to see the tapestry workshops.